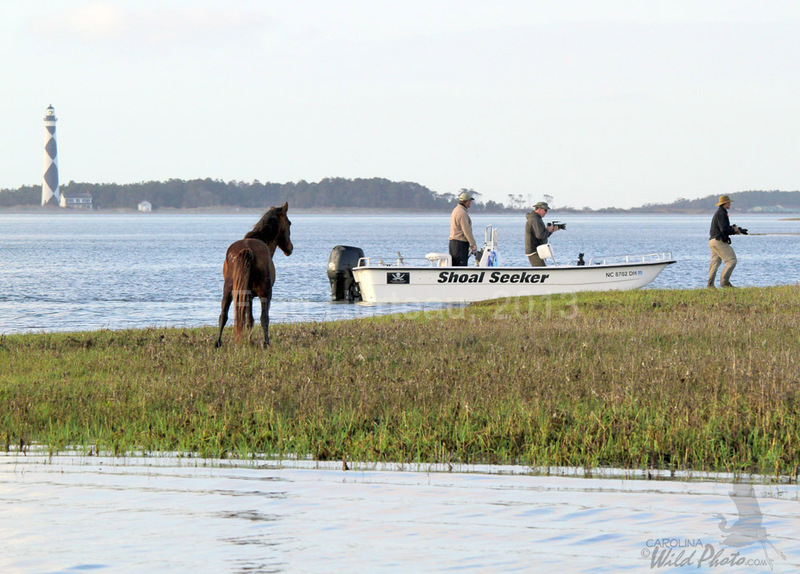 The only way to reach Shackleford to see these horses is by boat. You can take your own boat, but if you don't have one, you can ride one of the passenger ferry services or tour services. During peak tourist season it is advised to call ahead and make reservations for the day and time you desire. 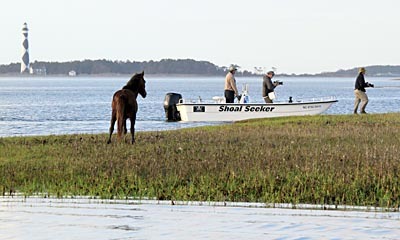 At left is a photo depicting the sort of boat you might expect to ride when visiting Shackleford Banks or Cape Lookout. This one is a charter boat from Seavisions Charters out of Beaufort. 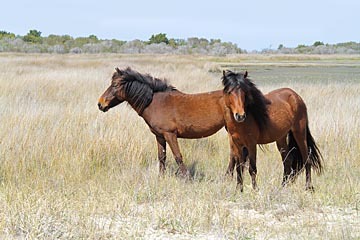 If you take a trip to the island to see the horses, you may find them near the eastern end of the island in plain view. If not, then you will have to go looking. In that case you'll need good hiking shoes. Keep to the grassy and sandy areas. 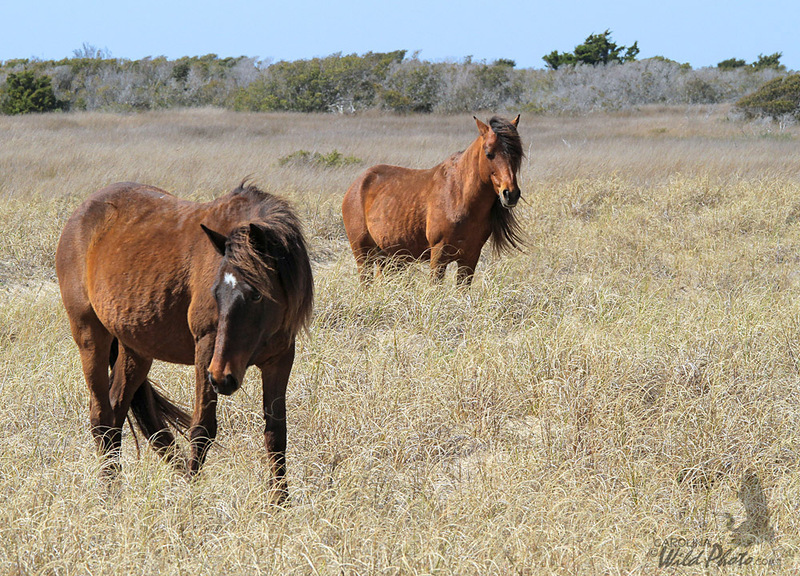 The horses often will go out into the tidal flats, but if you're tempted to follow them there you can easily become mired in muck up to your knees. If the ground is damp and mushy, be very cautious. It's also a good idea to not go alone. 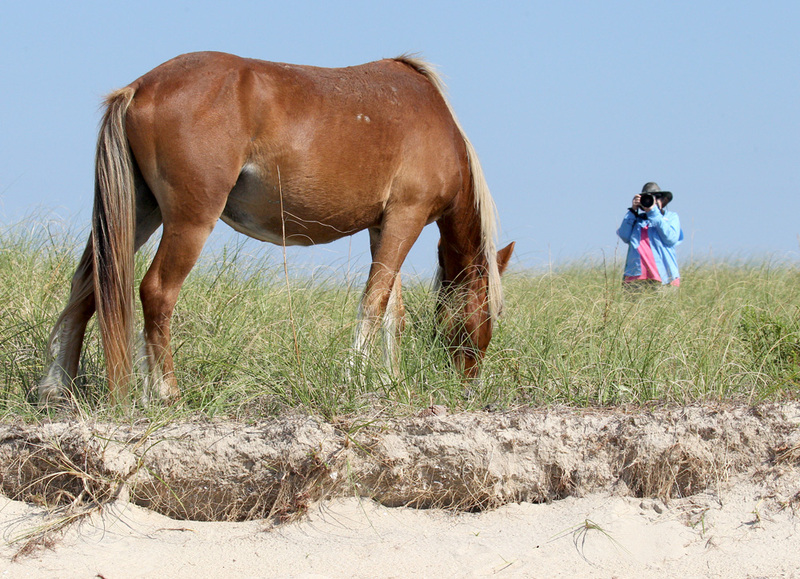 Besides, the more eyes you have helping to spot the horses, the better your chances of finding them. If you take advantage of a knowledgeable tour service or guide, your chances of success are greatly increased. These folks constantly watch the horses movements and are familiar with their habits. If you're serious about photography and want to make the most of your trip, it's definitely the way to go. For the serious photographer, reading this article will provide some helpful information about what to expect, and advice on choosing gear, clothing and footwear. 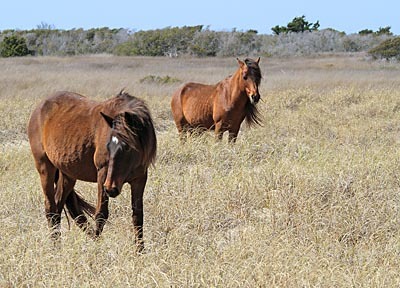 Keep in mind that these are wild horses. While they are used to humans being nearby, you cannot predict how they will act, so don't approach them too closely. If you're going it on your own, it's a good idea to check with the Park Service office located at the very eastern-most tip of Harker's Island (at the end of the road) to find out more about the horses and the park rules before you go. The tour services and guides know the rules and can give you great advice as well. You can also read this important (and official) FAQ which explains the rules and safety issues. 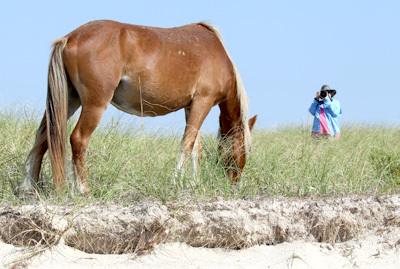 Although there are two compost style toilets on the island maintained by the Park Service, neither is anywhere close to the eastern end where you will most likely be looking for the horses. You will need to bring food or snacks, and water enough for the length of time you plan to spend walking and looking. Having some hiking or camping experience will be helpful too. If you've taken one of the ferries over, then you will have to keep track of the time so you can make it back to your pickup point at the appointed time for your return trip. You will probably want to take photos of these special horses, which will require at minimum a short telephoto zoom lens if you want to get good shots. Again, you should not approach the horses too closely. Just take your photos, keeping your distance, or they could likely just leave and then you'll have to go looking again. All the photos here were taken with telephoto lenses of 200mm to 500mm, which on a pocket camera would be from 4x to 10x zoom. You can see what a challenge getting some photos can be, especially if you're using a pocket camera or smart phone without a good zoom. 14All images are copyrighted and may not be copied or used for any purpose.